I felt sorry for her as she arrived, although surrounded by people and the media, she was forlorn, weary and had seen better days.The Auxiliary policewoman, herself a dancer of Highland in her youth standing next to me had a few tears, " I remember her from years ago how beautiful she was".No, not a dancer in decline, or a judge or even a mother, the object of so much attention was the Ste. Claire, a boat.Not just any boat but one of the Boblo Island boats built in 1910.This vessel had for years carried passengers and participants over to Boblo Island from Detroit for the Highland Games.Now this aged beauty had found a new home and hopefully a new life a few blocks from my house. 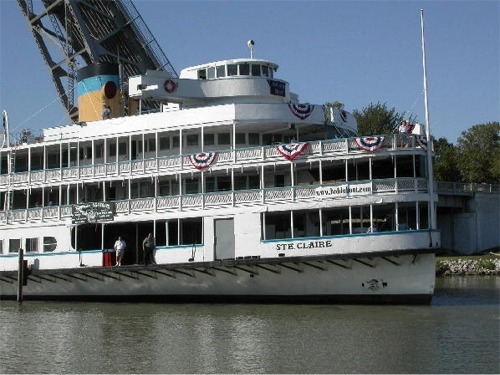 Bill Weaver, SOBHD Adjudicator and Teacher recall his experience with the Ste Claire. "Probably the words that come to mind most when I think about riding on the Boblo Boat as young child are huge and cool.Huge because even as an adult those boats, the St. Claire and the Columbia, are very large.Can you imagine how large they seemed to a child of 6 or 7 years of age? Yes, huge is the appropriate word.Cool because of a number of different things.First, because of the hoopla and awe associated with the St. Andrew's Pipe Band that always rode the Boat to the Island, playing for the throngs of people on board. Second, because of Captain Boblo who was eerily enthralling and intimidating at the same time (at least to this small child).I remember Captain Boblo being not that much taller than me.He always wore a red uniform with a white captain's hat, very much like the Skipper's on Gilligan's Island, but with an extra part attached to the front of the hat above the bill that stuck up above the top of the hat that said "Captain Boblo" in fancy cursive writing.He also seemed to always have lei around his neck along with a pair of small binoculars and he carried a small drum major's mace. The third, but most important reason I thought it was cool is because there were so many places on the boat that my dancing, piping and drumming friends and I could explore and get into.When I think back on it, you know those kids nowadays who are running all over the place screaming annoyingly while pinballing off of people seemingly without the slightest parental supervision?We were probably those kids, but from an earlier time. I remember finally pulling up to the dock on Boblo Island and feeling like what cattle must feel like; being herded from the boat through the dock and finally onto the island where there was room to move without fear of being trampled.I can still remember my mom and my grandma yelling at us to stay close and don't go too far so they could keep their eyes on us.I don't remember really listening, though.Fortunately, back in the 50's and early 60's it was a different, less threatening time for children. Once we got to the picnic area where they held the dancing competition as well as the races and games for spectators we staked out a table and set up for the day along with other dancing friends I think I enjoyed the races and games as much as the competition, though I did enjoy winning the medals and trophies.But, I also really enjoyed watching the egg toss totally in awe of how high and how far some of those people could throw and catch those eggs without having them break.And for reasons I still can't explain, I enjoyed watching to see which lady, all of whom seemed really old to me, could kick their shoe the farthest. After the competition we would get to go on the rides and that was really cool, probably the best part of the day, excluding the ride back on the boat I always thought the boat was even cooler at night when it was all lit up in contrast to the nighttime sky and the black, shiny water. Oh yes, Boblo was one of the most anticipated games of the season, at least for me and dozens of other kids who happened to pipe, dance or drum.Maybe our parents didn't feel the same way, but I suspect they would look back on those days with fond memories, too.St. Andrew's Highland Games in Detroit celebrated their 154th year this past August.I've been going to the St. Andrew's games since 1956 and I still look forward to them each year.And though they have been held in several venues since moving from Boblo Island, they are still wonderful highland games.For me though, my fondest memories of the St. Andrew's games will always be with the Boblo boats and the ride to the island."